William and Augustus Pontt were both born in South Australia. William was born on 3 September 1856 at Schreiberau, (south of Tanunda) Barossa Valley. His birth name was Friedrich Wilhelm Pontt and he was later known as William Henry Pontt or to the family as Willie. It is thought that William and Augustus along with another brother, Carl Ferdinand Pontt, (later known as Charles Frederick) came to Western Australia in the late 1860’s working first as carpenters and then taking up a lease at Strawberry and building a wayside inn. (To be confirmed.) Whether Charles was already living in Western Australia or the whole family came over together, is not known. Other members of the family that were in Western Australia during the 1870’s were Louis Albert Pontt (another brother), Eliza Charlotte Pontt, a sister and also their parents. The Advertiser having lately arrived from South Australia, wishes to meet with a run with not less than 5000 Sheep, either upon rental or otherwise. There is probably no doubt The Pontt’s new venture in Western Australia would probably have started off with high hopes. A sense of optimism would have prevailed as in any new business. However, within a short time any dreams they may have had would start to disintegrate. Within a year or two, Charles, William and Louis were bankrupted. Farmers are ultimately at the mercy of the elements and in a newspaper article dated 28th November 1875 a comment is made that the previous season in Champion Bay “was an exceptionally unfavourable one for pastoral purposes”. Did further bad seasons follow? If this was the case it would have been a ruinous situation for the Pontts. On the 17th April 1878 the following article appeared in “The Inquirer and Commercial News”. Re Chas. and William Pontt. Bankrupts. Assets returned in schedule, £8,495 10s. ; liabilities do., £8,688 15s. Proofs tendered at first meeting of creditors, £8,081 6s 11d. Re L. A. Pontt, bankrupt. Assets returned.£476; liabilities do., £2,158 13s. Proofs tendered At first meeting of creditors, £1.764 6s. 1d. This was the adjourned sitting for public examination of the bankrupts. Mr. Leake, Q.C., appeared for petitioning creditor; Mr. Parker for the trustee. Mr. Howell for various creditors. Thee Attorney General for the bankrupts. The bankrupts were all in attendance. Chas Pontt was sworn and examined at great length, touching the transactions of the firm, by Mr. Parker and Mr. Leake, when the Court adjourned at 2.30, until TUESDAY, 9th APRIL. On this day the examination of Chas. Pontt was outlined, and on application of Mr. Parker was further adjourned until the 10th June. William Pontt was also examined at length, and his examination also adjourned until 10th June next. The Court adjourned at 5.30. until WEDNESDAY, 10th APRIL. Re L. A. Pontt; when this bankrupt was sworn and examined similarly, and his examination also adjourned till 10th June. On the 12th June 1878 the next bankruptcy hearing took place. Re. C. & W. Pontt.— Adjourned public examination (from April last). Mr. S. H. Parker appeared for the trustee; Mr. Leake, Q.C., for the petitioning creditors. The Attorney General watched the proceedings on behalf of the bankrupts. The bankrupt Chas. Pontt was searchingly examined; Mr. Parker, at the outset, intimating to him that it was the intention of the trustee to prosecute him for fraudulent bankruptcy if it was possible. At the close of the examination, which lasted for nearly four hours, the Attorney General, on behalf of both bankrupts, asked for an order directing the trustee to pay their expenses, as they were without means. The Registrar said that if they had refused or neglected to come on the plea of their inability to meet the expenses it might have been a question for consideration, but as they had found means to attend, and under the circumstances disclosed in the examination, he refused to make any order on the subject. The Court adjourned at 3.30 till Tuesday, 11th June, at 9-30, when William Pontt, the other bankrupt, was similarly examined at some length, and the examination of both bankrupts closed. Re L. A. Pontt. — Adjourned public examination. Finally on the 25th October 1878 we once again read of the bankruptcy, but this time in regards to the very murky sales transaction of the racehorse Rosebud. To read the full articles of the Rosebud case go to these links: 11th October 1878 and 15th October 1878. The years between 1877 and 1880 were to see the brothers in trouble with the law. The first indication of these troubles is found in the following small article dated the 15th March 1878.
professional photographer came to Roebourne. On the 16th January 1880 The West Australian reported that William and Augustus were both standing trial for forgery and uttering. Auguste Pontt and William Pontt were jointly indicted for feloniously forging a cheque. There was also a second count for uttering Mr. Howell defended the prisoners. Mr. Hugh Hamersley, the prosecutor, said he was a sheep farmer, grazier, and “a little of everything,” residing near Guildford. Neither the signature to, nor the writing in the body of, the cheque produced was his, or anything like his handwriting. He had never authorised the prisoners, or any one else, with the exception of, Mrs. Hamersley, to sign cheques in his name. Witness believed the cheque to be in the handwriting of the prisoner William Pontt. The “p” in the word “pound” in the cheque, and the “p”in a letter written by the prisoner were exactly similar as like each other as two peas. There was likewise a striking similarity between other letters. The cheque was dated August the 12th, and the letter was dated October the 5th – the article prefix appearing in each case. Mr. H. de Burgh, a sheep farmer, residing at Moore River, said one of the prisoners (Auguste) came to his house on the 2nd Nov., and asked him if he could oblige him with some blank cheques on the W.A. Bank. The two prisoners rode up together as far as the river in front of the house, and Auguste walked up to the house for the cheques. Witness gave him some half-a-dozen blank cheques, which prisoner took away with him. Michael Reardon said that in November last he was in the employ of Mr. Robert Williams, about seventeen miles to the north of Mr. de Burgh’s station. The two prisoners came to his master’s homestead on the 3rd November, and William Pontt asked witness if Mr. and Mrs. Williams were at home. Witness said they were not that they had gone to Dandaragan. William Pontt then asked for the loan of a pen and ink, which were given to him. He took the pen and ink down the road to where his brother Auguste was waiting, and witness saw them sprawling on the ground, engaged in writing. They had the pen and ink away for about half an hour. When they returned them, they rode away in the direction of Gregson’s. Mr. John Gregson, a farmer residing at Cockleshell Gully, about 60 miles distant from the station where the previous witness lived at, said one of the prisoners, William, he believed, came to his house on the 5th November, about seven o’clock in the evening, just after sundown. He was very shabbily dressed, and looked travel-worn and weary; he wore a “wide awake” hat, which he pulled down over his eyes, concealing the upper portion of his face. He presented the cheque produced (the forged one) in payment for some rations which he obtained from Mrs. Gregson. Witness invited him to come in and rest himself, and have some tea, but he declined the proffered hospitality. Mrs. Gregson, wife of the previous witness, corroborated his evidence. The prisoner William Pontt bought 9s. 4d worth of rations with the cheque, and witness gave him the change £4 Os. 8d. Both prisoners were convicted on the second count – that of uttering. His Honor the Acting Chief Justice, in passing sentence, said addressing the prisoners : It would be folly for me to attempt to conceal from myself what is known to the whole colony, that during the whole of the time you have been here, you have been guilty of a career of fraud, treading upon the heels of the criminal law, which, however, at last has found you within its grasp. You have been found guilty of the charge now laid against you upon as clear evidence as ever was adduced in a court of justice. With the exception of yourselves and of George Payne – who was acquitted of the charge of felony for which he was indicted – all the rest of the calendar is made up of men who have been over and over again before the criminal courts of this colony and of England. You came here from Adelaide – a community of free men, who profess to look down upon this colony as tainted with the stain of convictism; and one would have expected from men of your bearing – your bearing is not ignoble – something like a noble example; but, as I have already said, during the whole period of your residence in this colony you have been leading a career of fraud. It is not the habit of Judges, in administering punishment under the criminal law, always to administer it to its fullest extent; and, the sentence I am about to pass upon you may appear slight compared with the punishment administered by my predecessors for similar offences, committed by men who had been previously before the criminal courts; still it will be my duty to give you such a term of imprisonment as will prove a warning to others of your own stamp. The sentence of the court is that each of you be imprisoned and kept at hard labor for two years. WILLIAM PONTT, a colonial prisoner undergoing sentence of two years imprisonment, pleaded guilty to an indictment charging him the larceny of a horse, the property of Mr. Stokes, at Perth, on the 10th September,. Mr. Howell, addressing the Court, said: I have been requested by the prisoner for whom appeared before the committing magistrate, to say a few words before your Honor proceeds to pass sentence upon him. Upon a perusal of the depositions, and particularly of a certain letter traced to the prisoner, I thought it advisable to recommend him to plead guilty to the charge upon which he has been indicted, and he has done so. It is with sorrow that I inform the Court that the prisoner is a man well connected, and it is to be regretted that he should be placed in, the position in which he now stands. I know that he feels that position keenly, and he wishes through me to express his contrition, trusting that the Court may be induced, under the circumstances, to temper justice with mercy. The Acting Attorney General: I may mention to the Court that I believe the prisoner to be as stated by his counsel, very respectably connected in South Australia, his father being a German, and I believe a very worthy and much esteemed citizen. The Chief Justice: The Court may be inclined to temper mercy with justice, but I have yet to learn that the fact of a man being well connected is any excuse for crime. I will not however pass sentence upon the prisoner today, and if I find that I can give effect to the recommendation of his counsel, I will do so. I think he acted well under Mr. Howell’s advice, in pleading guilty. Let the prisoner be remanded until tomorrow. I do not know if the sentences were served concurrently, however we hear no more of the Pontt brothers until a small article appeared in the West Australian. It seems the brothers gave up their life of farming, livestock “adventures” and unlawful escapades. They were now looking towards new horizons. Maybe it was a case of “there’s money to be made in them thar hills”. I of course speak of the fever that gripped many men during the later part of the 19th century in the north of Western Australia. The promise of riches from gold. A new chapter in the lives of Augustus and William was to open. By 1885 we know that the brothers were in Roebourne. It was early in that year that one of Australia’s most diabolical double murders was committed. Roebourne bank manager Thomas Anketell and his accountant Henry Burrup were bludgeoned to death, with a pickaxe, whilst sleeping on the Union Bank premises. In an ensuing court case, Mrs Caroline Platt alleged she saw a figure making away from the Bank in the early hours of the morning of the murders. It was dark but she believed it was “Pontt” from the outline of his body. Her description fitted that of William however he was not in Roebourne at the time of the murders. He had left the town the day before. He was indignant that his name was dragged into the case as is evidenced by the letter below to The West Australian newspaper. In truth, it was his brother Augustus that would have been limping, as his foot was bandaged after damaging it during well sinking and he could not wear a boot. It is through the letter that we know that William was on an expedition for gold. His sarcasm in the opening lines also indicates that perhaps he was not liked by all. To the Editor of the West Australian. Sir, – In your issue of the 28th of February I noticed that one of my many friends in this country has been good enough to drag my name into the Roebourne Bank murder case. Your authority in this matter says that suspicion also rested on a man called William Pontt, who was noticed limping the morning after the murder and had a cut in his boot. Had your informant taken the trouble to make enquiries, he would have found that William Pontt left Roebourne some time before the murder, in company with Messrs. Samuel Young and Fred Townsend, of the Mill Stream Station, with a view of buying horses for our present expedition, and that neither of us returned to Roebourne for nearly three weeks after the murder had been committed – a fact which nearly all the people in Roebourne, especially the police authorities, must well know. With reference to my having been seen the morning after the murder with my boot cut and limping, that is simply absurd. I challenge all Roebourne to say that I was in Roebourne the day after the murder or within a fortnight of that time and further that any persons ever saw me with my boot cut or limping, since I have been up in this part – nearly, two years. Unfortunately at present I am unable to act as I should like in the matter being out of the reach of civilization, engaged on a prospecting expedition to the Ord River. But at some future date I hope to make further enquiries about this matter. If you will kindly insert the above letter, you will much oblige. Upper Fitzroy, Kimberley District, May 3. We, have received a communication from Mr. F. Ward, of Derby, on the same subject, asserting that, of his knowledge, William Pontt was miles away from Roebourne at the time the murder was committed. – ED. W.A. There are several articles starting from 1889 and throughout the 1890’s that refer to the Pontts and their gold adventures. It seems that the brothers had a great degree of success that most others could only dream of. In the midst of discovering gold they still found the time to be storekeepers! 231 OUNCES MORE GOLD BROUGHT IN. THE KLONDIKE LEASES, Mr. R. G. Gladstone, the Inspector of Mines in the Pilbarra district, sent the following report, dated April 27, to the Under-Secretary for Mines with regard to the Salgash belt of country in the Pilbarra goldfields :- ” Sir, I have the honour to inform you that after leaving Yandicoogina I carried out my intention as indicated in my letter of 14th inst, of tracing the Salgash belt of country to the Klondike leases. There is no doubt in my mind that what has already been found is only the prelude to further discoveries in this belt. The same class of country exists for nearly 20 miles east of the Klondike leases, the ranges being of schistose formation, with deposits of opaline, and seamed with outcropping quartz reefs and leaders. My next sojourn was at a very rising township called – SALGASH, and the importance of this place merits a somewhat lengthy description. But a year old, the camp already enjoys the rare privilege of possessing two names – Salgash, a nice and easy one to write or pronounce, and the heathenry appellation of Warrawoona. A couple of years ago there were certainly two or three small parties at work, but the real discovery of rich gold dates back to but 12 months ago, when a splendid leader was unearthed by a prospector called Charles Kopckie, who applied for, and obtained, a reward claim, out of which he has done fairly well. It is not always, however, the early bird that catches the early worm in mining, and it remained for Messrs. Pontt and Corboy some little time later on to peg out the Klondyke claim. This is of six acres in extent and lies half a mile N W. of the Reward claim. The outcrop runs along on the big range of hills which appears to form the dividing limit of the gold-bearing country A tunnel has been driven 70ft. into the hill, and a shaft proves about 70 ft. of backs. There seems to be a continuous chute of gold running through the reef, which latter varies from 1 ft. to 3 ft. in width. It is a species or micaceous schist and has hardly any dip at all. Already some perfectly extraordinary crushings have been recorded, in fact they are almost fabulous. One lot of four tons gave 400 oz., another of 20 tons about 800 oz., whilst a further parcel of 60 tons returned, between 6 oz. and 7 oz. to the ton. William died on the 12th November 1892 from “Morbis Cordis/Oedema of lungs” (heart disease and fluid on the lungs) aged only 36. Augustus died 2nd January 1900, in Warrawoona. The cause of death was cirrhosis of the liver and acute inflamation of the stomach. His fate was a sad one as can be seen in the following small notice in The WA Times. William and Augustus appear to have been very close. They travelled across Australia together to seek their fortunes. Even after most of their family returned to South Australia after the bankruptcies, the two brothers stayed together in Western Australia. Throughout their adult lives and through thick and thin, living in different parts of the state, they were always together in their escapades and ventures. I can’t help but wonder how William’s early death must have affected Augustus. A long way from family and living in some of the most inhospitable and hottest country in Australia, perhaps the loss of his older brother and companion was too much for Augustus and a reason for his early demise. Ultimately, in the North West, both William and Augustus were to prove themselves as hardworking and industrious men, always with their eyes open to opportunity. Sadly, neither brother lived to see old age or enjoy the fruit of all their labours. POLICE GAZETTE ENTRIES WHERE THE PONTT’S HAVE BEEN MENTIONED. An enquiry has been held relative to dead body of a man found about 9 miles from C. Pontt’s residence, and about 8 miles from Tandanooka, on the 28th January last; the body was much burnt by a bush fire, and a gun which was laying at his side was also partly burnt. The body was identified by Henry Balby as that of late William Brown, exp. Description – middling stout, about 50 years at time of death, about 5 ft. 10 in., dark brown hair, blind of one eye, swarthy complexion. Report to be sent if the late Reg. No. of the deceased William Brown is known to any member of the Police. On the 30 June last, Isaac Doust and W. Pontt, free, found the remains of a white man east of Forey island, about 14 or 16 miles from Shark’s Bay, and state that from appearances the man must have been dead about 12 months. There was a new pannican and some pieces of a check cotton shirt lying about, but no other kind of clothing was seen. It is supposed that the man perished for want of food and water. The remains were buried by Messrs. Doust and Pontt, who reported this occurrence to Northampton Police. GEORGE alias ROGER BROWN, exp., late Reg. No. 8604. Description—Middling stout, age 37 years, height 5ft. 7 3/4, black hair, dark hazel eyes, long visage, dark complexion, anchor and flag left arm, scar right wrist, D left side, crucifix and flag left arm, a laborer; is charged on warrant issued at York, on the 17th inst., with feloniously forging a cheque on the W. A. Bank, dated 26th April 1876, for £1 2s. 4d., purporting to be drawn by C. & W. Pontt in favor of R. Brown or Bearer. The remains of a white man have been found by Isaac Doust and —. Pontt to the eastward of Forey Island; from enquiry made by Sharks Bay Police, there is every reason to believe that these are the remains of JOHN T. JACKAMAN, drowned off Forey Island about 18 months ago. JAMES BAKER, Reg. No. 9068, imp. convict, is reported as being employed at Whitfield’s place, on Pontt’s Station, Upper Irwin, as cook. Immediate enquiry to be made and report sent to Detective Office. Referring to William Doogood alias Stuttering Billy, Reg. No. 8832, has been found, from private information received at Detective Office, at Messrs. Pontt’s, Upper Irwin, where he was passing under the name of Henry Jones alias Willam Hunt. WILLIAM PONTT, free, stout, 25 years of age, about 5ft. llin. high, red hair, full visage, fresh complexion; is charged on warrant issued at Greenough, on 21st ult., with feloniously stealing one roan horse, of the value of £18, at Greenough, on the 16th October last, the property of Charles Gilbert. WILLIAM PONTT, free, at Greenough, on the 7th inst., by L.S. Anderson. WILLIAM PONTT, free, sheep-farmer; charged at Greenough Police Court, on the 16th inst., and committed for trial at the Quarter Sessions, Geraldton. CHARLES F . PONTT, free; charged at Guildford Police Court, on the 12th inst., by P.C. White, with cruelly ill treating a horse at Guildford, on the 5th inst. Fined £1 and costs. WILLIAM PONTT appeared to his bail, at Geraldton Quarter Sessions, on the 7th inst., and discharged; not guilty. CHARLES P. PONTT, is charged on Warrant of Commitment, issued at Perth, on the 5th inst., with non payment of a fine of £1 and costs 10s. 6d. Vide Police Gazette, 1878, page 29. AUGUST HENRY PONTT, stout, age about 33 5ft.10in. high, light brown hair, fair complexion, bushy sandy whiskers ; a cheque for the payment of £2, drawn by him on the National Bank of Australasia, the property of Michael McMahon, the said sum of £2, payable under the said cheque, being then due and unsatisfied to the said Michael McMahon, feloniously did steal, take and carry away. Dated Perth, 5th May, 1879. Vide apprehensions. AUGUST HENRY PONTT ; charged at Perth, on 8th inst. Discharged, by Pontt paying McMahon the amount. Stolen from William Stokes’ run, Greenough Flats, some time in August last,—chestnut gelding about 15 hands high, silver mane and tail, branded on neck under mane MO and J on ribs. This horse was offered for sale at Daniel King’s, Moore river, supposed by Charles and August Pontt. WILLIAM PONTT; stealing one black mare, 14 hands high, branded S,R, on ribs, off nostril torn out, the property of William Stokes, of the Greenough. This mare was seen in William Pontt’s possession, at Hill River, on 12th inst. 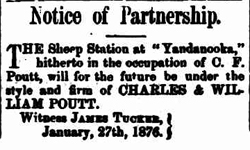 Dated Geraldton, 25th November, 1879. 3rd December 1879 Police Gazette. Stolen from Wilham Stokes’ run, Greenough Flats, some time during last month,—black mare, aged, about 14 hands high, branded S,E, on ribs, off nostril torn out. This mare was seen in William Pontt;’s possession. Vide Warrants Issued, P.G., 1879, page 194. The black mare therein described has been found on William Stoke’s run, Greenough, She appeared to have been ridden and her mane and tail trimmed. The following horses were found in possession of August Henry and William Pontt, when arrested on 4th inst., light bay mare, 14 hands high, white hairs round off hind fetlock, no brand or mark visible, dark brown gelding, 14 hands 3in. high, branded DK conjoined, near side under saddle, large white spot on forehead, two hind fetlocks white. Officers in charge of Sub-Districts will cause inquiry to be made, with a view of ascertaining how they came into the Pontt’s possession. The two horses therein described, found in possession of August Henry and William Pontt are their own property. AUGUST HENRY, and WILLIAM PONTT ; charged at Perth, on 2nd inst., and committed for trial. Sentenced to 2 years hard labour Forging and uttering. The horse therein described stolen from William Stokes’ run, Greenough, has been recovered by Detective Glover, sold by August Pontt to Joseph Hassock of Fremantle. Vide Warrants Issued. WILLIAM PONTT, at York, Green Mount, on 29th ult., by P.C. Randall. Remanded. WILLIAM PONTT, stout, age 29, 5ft. l l i n . high, light hair, florid complexion ; stealing one chestnut horse, in August last, the property of William Stokes. 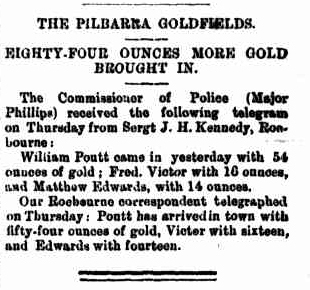 Dated Fremantle, 24th March, 1880. Vide Apprehensions. WILLIAM PONTT, charged at Perth, on 12th inst., and committed for trial. WILLIAM C KING, at the De Grey, on the 12th May last, by P.C. Best; stealing the two horses first mentioned in above reference, the property of W. and A. Pontt. Brought up at Derby, on the 20th ult. Committed for trial. Both horses recovered. Derby.—The grey gelding mentioned in above references, the property of W. and A, Pontt, has been found and restored to owner. Wayside House Licenses, Bassett & Pontt, Sign – Digger’s Rest, Town or District – Pilbara. Roebourne.-On the 22nd Ult. , from owners’ store, Nicol Goldfield, £2 10s. in silver, and 1/2 oz. rough gold, the property of Messrs. Bassett & Pontt. John Jordan committed the larceny. Vide Apprehensions.- C. I. 8. WILLIAM PONTT, charged at Roebourne, on the 25th ult., by P.C. Crockett; supplying spirituous liquor to ab. nats., £20 fine and costs or 3 months h.l. assaulting ab. nat. woman Wallera, fined 20s. Marble Bar,- On the 12th ult., at the Court House, before A. Ostlund, R.M., Coroner, on the body of Frederick Dawes, who was found dead at Pontt’s Find, near Marble Bar, on the 8th ult., with a bullet wound in the head. Verdict- “Suicide while temporarily insane.”- B/5280.